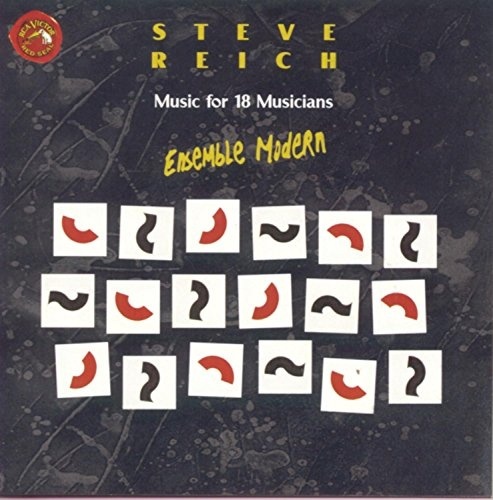 Steve Reich's 'Music for 18 Musicians,' performed by Ensemble Modern, is a pulsing exploration of percussion and tone. With chord progressions unfamiliar to most listeners, the rhythm unifies the piece as a whole as well as creating texture for each movement. Composed over two years beginning in mid-1974, 'Music for 18 Musicians' is similar to the minimalist works of Philip Glass and Terry Riley. Like the works of the other minimalists, Reich's work breaks many rules while maintaining a connection to other musical traditions. While unmistakably modern, Reich's compositional techniques have a lot in common with 12th-century ecclesiastical composer Pérotin, who combined swift and complex polyphony with a much slower bass line of Gregorian chants. The intriguing nature of this composition makes for fascinating listening. Created without the use of synthesized instruments, these sounds are remarkably unusual. The listener will be as interested in how the music is performed as in how it sounds.